Every Sunday at 11 a.m., the Columbia University No Budget Sketch Show begins filming a new student-written comedy sketch. By 1 p.m., CUSS has all the footage it needs. After editing the video during the week, the group releases its new show directly to Facebook on the following Sunday. This process repeats itself every Sunday of the academic year. This is an unusually high production rate for an on campus film group. Many of the group’s sketches are about Columbia, although its content is not exclusively school-related. Two of CUSS’s most popular videos are its annual musical and its “Shmasterpieces of Western Lit,” the group’s take on Comedy Central’s “Drunk History.” In CUSS’s adaption, two drunk seniors describe books they’ve read in Literature Humanities, and actors act out their descriptions. Last year’s musical, “Upper West Side Story,” gave the account of a doomed romance between a sorority sister and a Columbia “sadboi” in five minutes and 41 seconds. Some of the group’s videos are a bit more abstract, such as last year’s “John JJ’s.” The sketch emerged last semester when JJ’s Place flooded and John Jay became “John JJ’s” during late-night dining hours. It featured two dazed students eating large amounts of food, some of which was stuck in their hair, while “John JJ’s” was whispered in the background and Illuminati symbols appeared on the whiteboard behind them. “Sometimes people are like, ‘I have no idea what that was, I’m so confused,’ but I think we like those reactions too,” Hellman said of audience responses to the sketch. 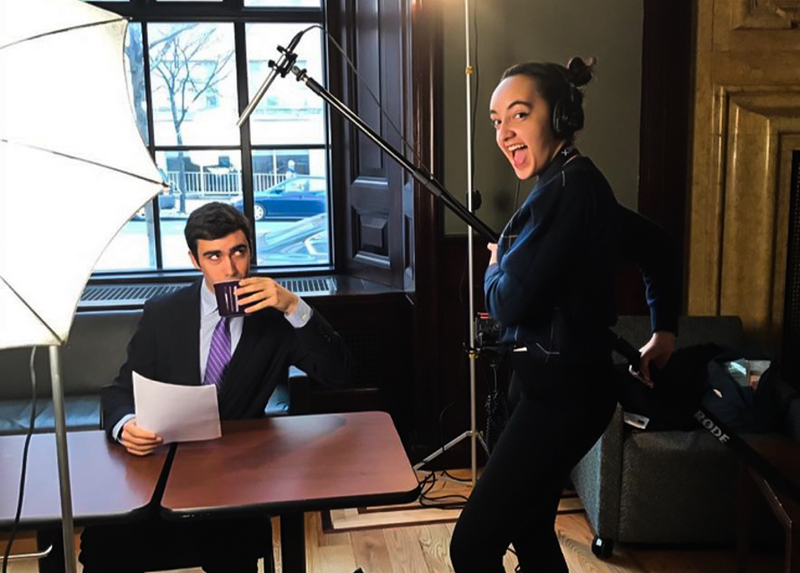 The concept for CUSS arose in November 2014 when Michael Rodriguez, CC ’16, and Anna Hotter, CC ’16, decided they wanted to make short, funny videos on a regular basis. The pair began recruiting members in February 2015 and the club had between 10 and 20 members in its first year. Today, CUSS has 51 members. Among these members is a team of 17 actors, as well as staff writers, script supervisors, directors, producers, cinematographers, a publicity team, a treasurer, a secretary, and a social chair. For the first time this semester, CUSS also has a costume designer. Both CUSS’ membership and the number of prospective new members have steadily increased since the club’s inception. Hellman and co-president Rhys Lewis, BC ’19, said casting actors this semester was particularly difficult, as 40 people auditioned for the 17 available positions. When making their casting decisions, Hellman and Lewis look for flexibility and creativity in their performers, who often improvise during sketches. “We’re not casting for specific roles; we’re casting for a semester. We want to have people who can play a million different characters,” Hellman said. What CUSS values most is the collaboration between its team members. The high volume of content the group produces leads it to strive toward teamwork, not perfection.